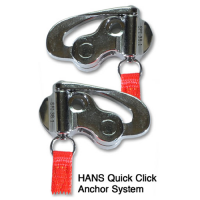 Description: For Use with Hans/Simpson Post Anchor Tethers. These do not include backing washers. Fit SA2015 Helmets and helmets with backing washers already installed. The HANS Device Sport II, while being extremely effective and popular, has some inherent design characteristics that cause some concern with some drivers. In particular, the HANS Device signature design can create pressure on the collarbone area and subsequent discomfort for some racers. Optional gel pads are available which can greatly reduce this issue in most cases. 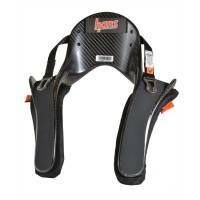 In addition, while providing outstanding front impact protection, the HANS Device Sport II design does not provide any side impact protection unlike some other products on the market. 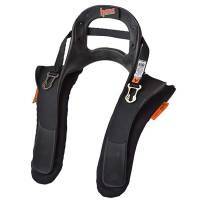 Some drivers report issues with shoulder harnesses sliding off the HANS Device. 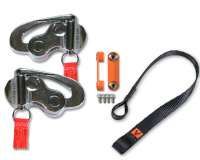 Many drivers opt for specially designed restraint systems that utilize a 2” shoulder harness and or a sternum strap to reduce the possibility of the harness sliding off the device. 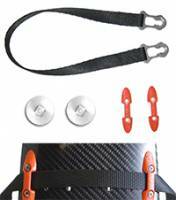 At Pit Stop USA, we are experts in Head and Neck Restraint products. According the SFI Foundation, "Effective January 1, 2012, the SFI Foundation requires that Head and Neck Restraint Systems shall be inspected for re-certification every five years after the date of original certification." So don't jump for that used Hans device for sale as you don't know what might of happened to it and if there is something that would keep it from being able to be re-certified. It is our commitment to assist you by offering you the best auto racing safety products and technology and backing it up with expert advise to help you to make the right decision for your type of racing. We don't believe that there is one single head and neck restraint product that is perfect for everyone. 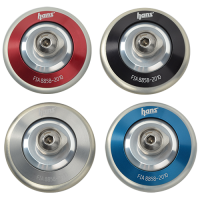 Give us a call and we will help you determine which product is right for you! Pit Stop USA is The Online Motorsports Superstore! 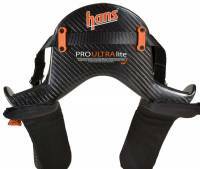 We proudly feature HANS Performance Products makers of the HANS Device. Calling the HANS Device the international standard for preventing head & neck injuries, HANS Performance Products was awarded the Auto Racing Safety and Humanitarian Service Award by the American Auto Racing Writers and Broadcasters Association. Despite claims you might see elsewhere on head and neck restraints, recent SFI 38.1 recertification testing has confirmed that HANS Devices continue to offer industry-leading performance. 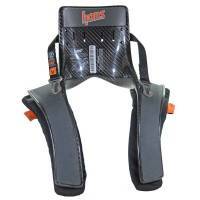 Championship drivers in all levels of motorsports choose the HANS Device to keep them safe. Since Dale Earnhardt was killed in the Daytona 500, at least 150 people have died in U.S. racing. None of those deaths occurred at the highest levels of racing, most who died were drivers at small oval tracks, who usually aren't required to wear head and neck restraints that could save lives. Drivers in NASCARs top series are required to wear SFI 38.1 approved head and neck support devices like the HANS Device since 2001. The result: no racing deaths in six years in those divisions. While NASCAR requires its top division drivers to wear a head-and-neck restraint, it doesn't extend that requirement to the several thousand drivers who race at NASCAR-sanctioned short tracks. NASCAR does strongly recommend that all drivers at its sanctioned tracks wear head-and-neck devices and have up-to-date safety equipment in their cars. Dr. Hubbard conceived the HANS Device 25 years ago, but it took time to develop a version that could be used in single seat racecars. The HANS Device became mandatory in Formula 1 in 2003 and since that time has been credited with saving many drivers from serious and/or fatal injuries. The work done for F1 has lead to acceptance of the HANS Device in all forms of racing, including NASCAR stock cars and trucks; oval and drag racers, sportscar racers, boat racers and many other racers worldwide.